PALNI has increased the number of in-person meetings in the last two years due to additional Advisory Groups and more collaborative activity. The PALNI Meeting app was created to ease the burden of spread-out meeting information as well as assist in getting to, during, and leaving the meeting. Each section of the meeting app was designed for a specific travel point when attending an in-person meeting – beginning to end. For other phones, this can be found under your "Sharing" options. Click "Add to Homescreen" and voila! 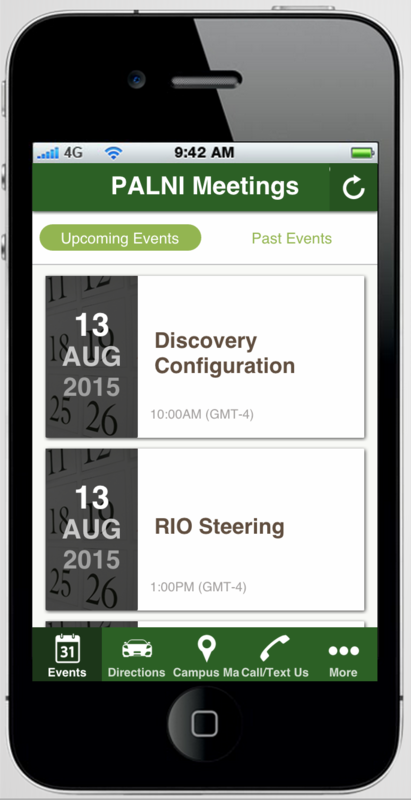 The PALNI Meeting app is now on your phone. ***Note, you will need an internet connection to access this web-based app - meaning it will work on smartphones while on the road but will only be accessible on wifi devices (iPod touch for example) at wifi points. As of 2017, PALNI uses an education version of Zoom with no additional add-ons. 20 Virtual Zoom instances that can run simultaneously with up to 100 participants each.